Cheap sushi, you say? Must be horrid. Actually, no. Kulu Kulu (the Covent Garden branch anyway – there’s another in Soho and South Kensington), is a cheap place to eat AND does decent sushi. Tucked away from the bustle of Neil Street and Long Acre, Kulu Kulu is hidden just off Endell Street on Shelton Street. With its strip lighting and bare decor, it doesn’t look very inviting. But then, looks can be deceiving. How many times have you gone to a fancy restaurant only for them to overfuss what should be a seemingly simple dish. Kulu Kulu is less slick, vibrant and in-your-face than places such as ‘Yo Sushi’, with subtly-patterned plates and a simple, pretty much non-existant menu – most of what’s on offer glides past at perfect nose height. Perhaps though, it doesn’t need all that brashness to tempt customers in. 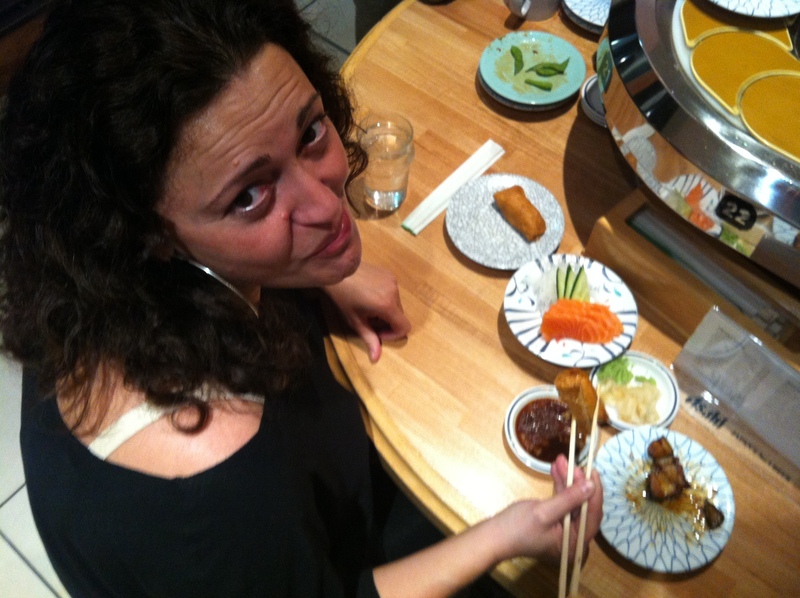 Allegra looks dismayed as all these photos are keeping her from the sushi. Inari – rice wrapped in fried bean curd. This was slightly sweet and by the time I got round to having a taste, the bean curd was clammy and cold. A bit like the texture of dead skin. Definitely recommend getting this one hot! Nasu Dengaku – aubergine in soy bean sauce. Delightfully sticky, sweet and chewy. 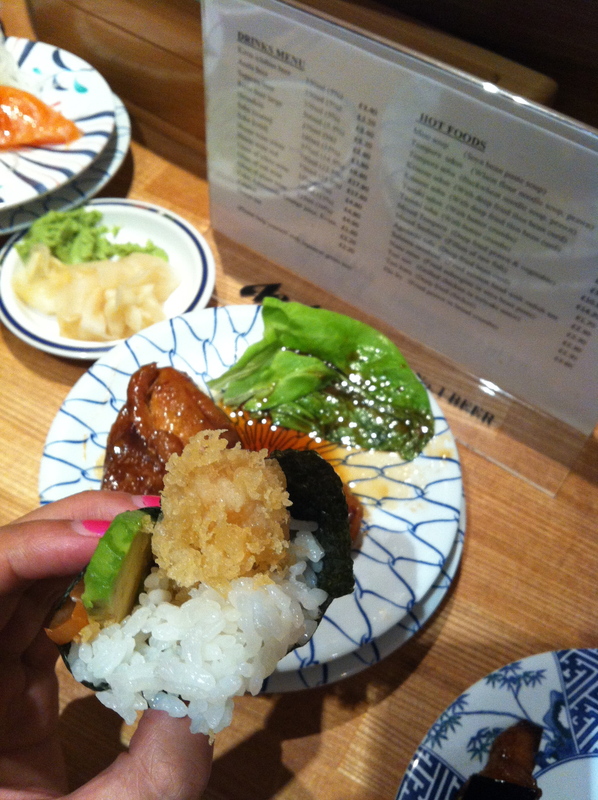 Probably one of my favourite Japanese dishes. Teriyaki Chicken – chicken grilled in a sweet soy sauce marinade. The chicken was a little over-cooked but the teriyaki sauce was tangy which made up for it. One of the more filling dishes. Prices range between £2 – £4 for little dishes with bowls of noodles available to order separately for between £8 – £10. It’s not amazing, but it’s a great cheap eat for London and the food is well-prepared and fresh. 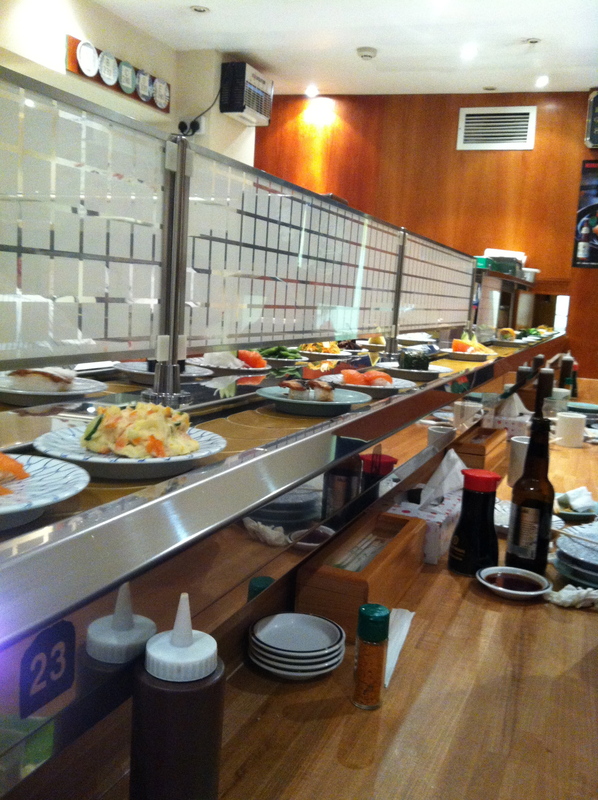 Top Tip: Get the seat closest to where the conveyor belt starts for all the freshest choices. And who you calling old?!?? Twas yum – amazing value for money. Spot on lady.